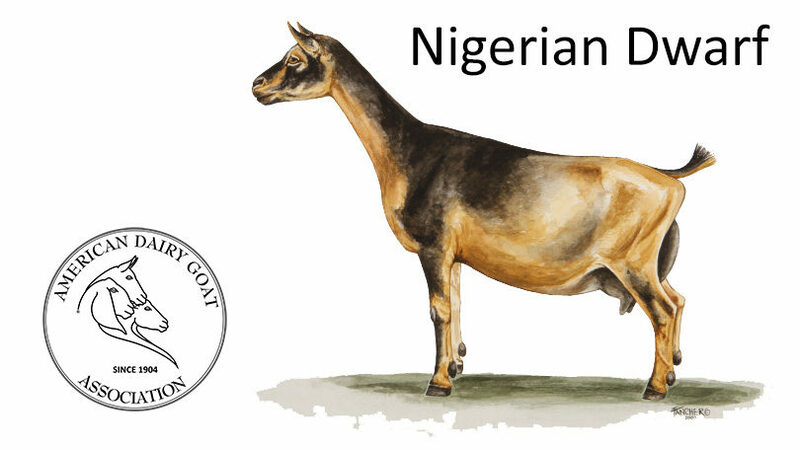 American Dairy Goat Association currently maintains herd books for the following breeds of dairy goats: Alpine, LaMancha, Nigerian Dwarf, Nubian, Oberhasli, Saanen, Sable and Toggenburg. 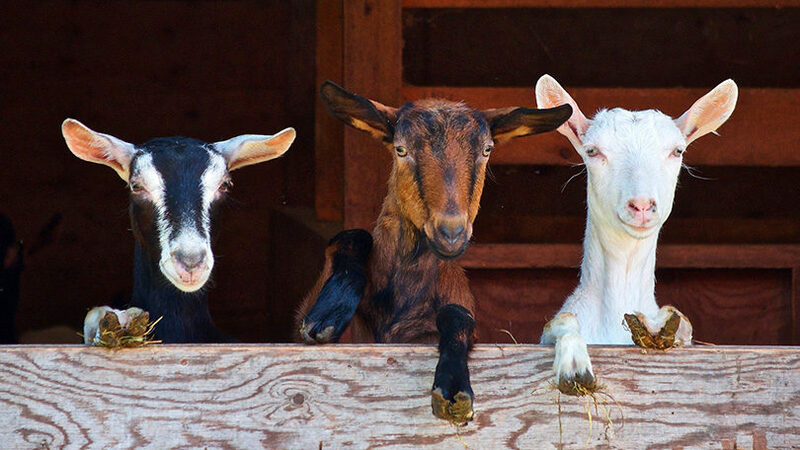 The Alpine Dairy Goat is also referred to as the French Alpine and registration papers for this dairy goat use both designations and they are synonymous. 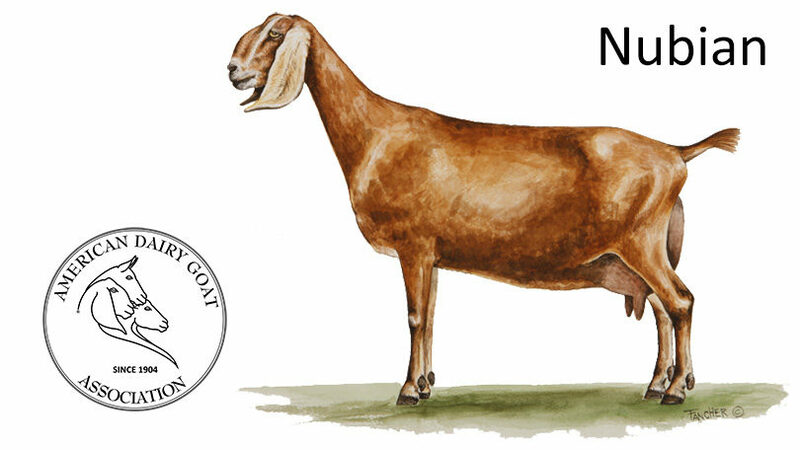 The Alpine dairy goat is a medium to large size animal, alertly graceful, with erect ears, offering all colors and combinations of colors with distinction and individuality of appearance. 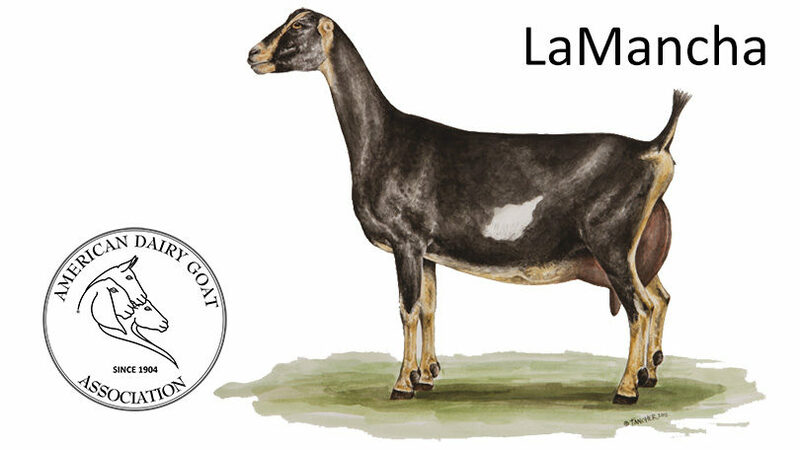 The LaMancha goat was developed in the U.S.A. It has excellent dairy temperament and is an all-around sturdy animal that can withstand a great deal of hardship and still produce. 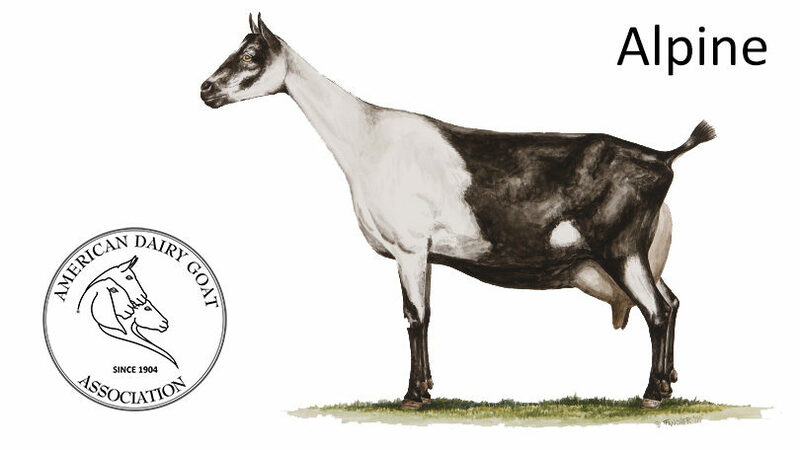 Through official testing this breed has established itself in milk production with high butterfat. 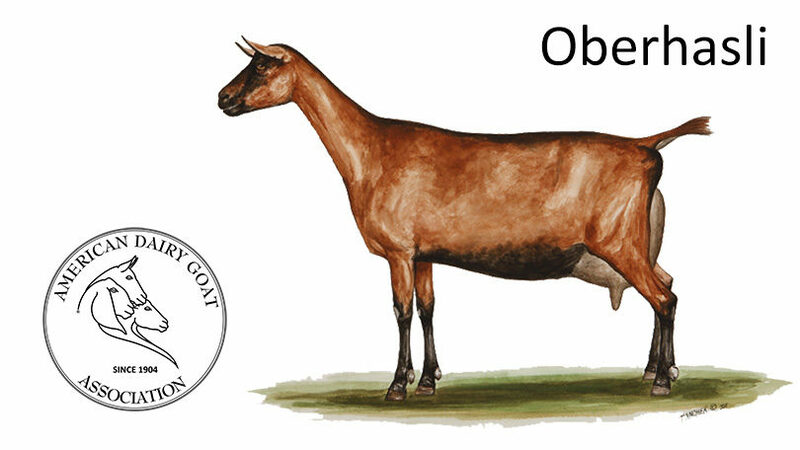 The Oberhasli is a Swiss dairy goat. This breed is a medium size, vigorous and alert in appearance. Its color is chamoisee. Does may be black but chamoisee is preferred. Chamoisee is described as: Bay ranging from light to a deep red bay with the latter most desirable. A few white hairs through the coat and about the ears are permitted. Markings are to be: two black stripes down the face from above each eye to a black muzzle; forehead nearly all black, black stripes from the base of each ear coming to a point just back of the poll and continuing along the neck and back as a dorsal stripe to the tail; a black belly and light gray to black udder; black legs below the knees and hocks; ears black inside and bay outside. Bucks often have more black on the head than does, black whiskers, and black hair along the shoulder and lower chest with a mantle of black along the back. Bucks frequently have more white hairs through the coat than does. Ears should be erect and alertly carried. The face is straight or dished. A Roman nose is discriminated against. 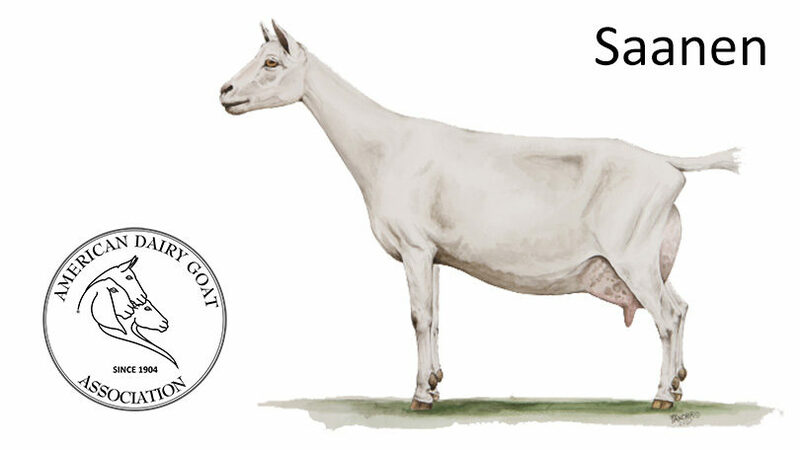 The Saanen dairy goat originated in Switzerland. It is medium to large in size with rugged bone and plenty of vigor. Does should be feminine, however, and not coarse. Saanen are white or light cream in color, with white preferred. Spots on the skin are not discriminated against. Small spots of color on the hair are allowable, but not desirable. The hair should be short and fine, although a fringe over the spine and thighs is often present. Ears should be erect and alertly carried, preferably pointing forward. The face should be straight or dished. A tendency toward a Roman nose is discriminated against. 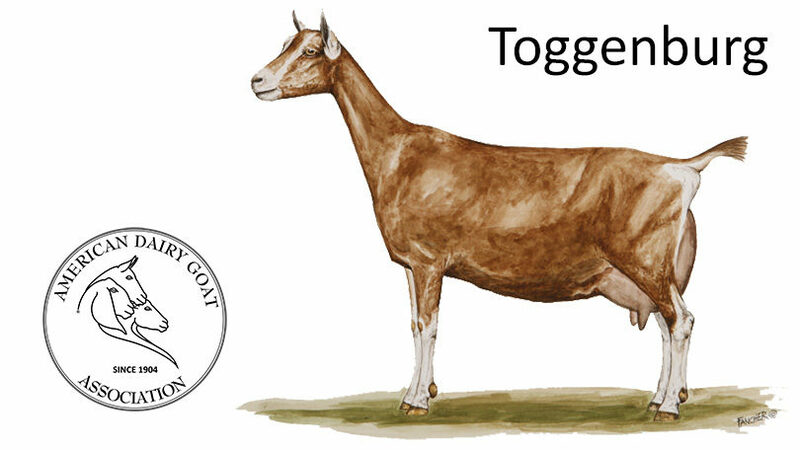 The Toggenburg is a Swiss dairy goat from the Toggenburg Valley of Switzerland. This breed is medium size, sturdy, vigorous, and alert in appearance. The hair is short to long in length, soft, and fine. Its color is solid varying from light fawn to dark chocolate with no preference for any shade. 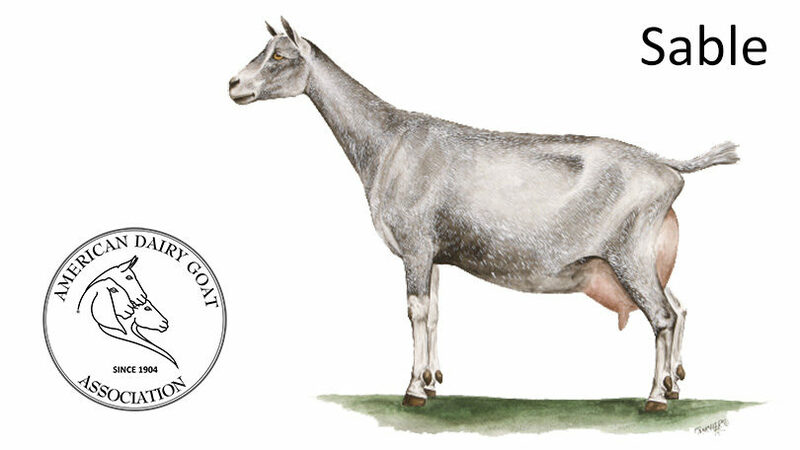 Distinct white markings are as follows: white ears with dark spot in middle; two white stripes down the face from above each eye to the muzzle; hind legs white from hocks to hooves; forelegs white from knees downward with dark vertical stripe below knee acceptable; a white triangle on each side of the tail; white spot may be present at root of wattles or in that area if no wattles are present. Varying degrees of cream markings instead of pure white acceptable, but not desirable. The ears are erect and carried forward. Facial lines may be dished or straight, never Roman.